In 2082, a catastrophic explosion rocks the dedication ceremony of the new United Nations in New York City. Security Director Julia Moro is on the job, chasing after the misogynistic leader of Patria, a long-disbanded international terrorist organization now being whispered about again on the streets. This dangerous, shadowy figure has been linked to several bombing attempts and vicious attacks on women, including the Women of Peace--an organization headed by thirteen bold women who have risked their lives to restore worldwide peace. As Julia's investigation unfolds, a deep secret from her past threatens to strip her of everything she cherishes and plunge her into unrecoverable darkness. 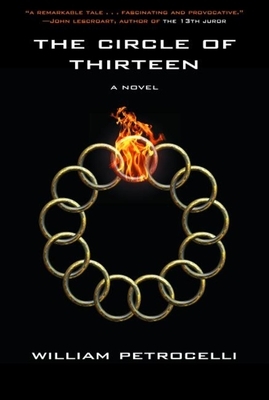 The Circle of Thirteen's gripping narrative weaves back and forth in time, from an act of domestic violence that created the disturbed personality of the Patria mastermind, to the two weeks leading up to the bombing at the UN, to events half a century before the bombing that directly influence it. The strong, relatable women and the unbreakable bond between them provide an emotionally grounded window into the future's unforgettable history. Bill Petrocelli is the co-owner, with his wife Elaine, of the famed independent San Francisco Bay Area Book Passage bookstores. As a former Deputy Attorney General for the State of California and a poverty lawyer in Oakland, Petrocelli has long been an advocate for women's rights. The Circle of Thirteen is his first novel.